This article is about the type of star. For the television sitcom, see Red Dwarf. "M dwarf" redirects here. For substellar objects, see brown dwarf. A red dwarf (or M dwarf) is a small and cool star on the main sequence, of M spectral type. Red dwarfs range in mass from about 0.075 to about 0.50 solar mass and have a surface temperature of less than 4,000 K. Sometimes K-type main-sequence stars, with masses between 0.50-0.8 solar mass, are also included. Red dwarfs are by far the most common type of star in the Milky Way, at least in the neighborhood of the Sun, but because of their low luminosity, individual red dwarfs cannot be easily observed. From Earth, not one is visible to the naked eye. Proxima Centauri, the nearest star to the Sun, is a red dwarf (Type M5, apparent magnitude 11.05), as are fifty of the sixty nearest stars. According to some estimates, red dwarfs make up three-quarters of the stars in the Milky Way. Stellar models indicate that red dwarfs less than 0.35 M☉ are fully convective. Hence the helium produced by the thermonuclear fusion of hydrogen is constantly remixed throughout the star, avoiding helium buildup at the core, thereby prolonging the period of fusion. Red dwarfs therefore develop very slowly, maintaining a constant luminosity and spectral type for trillions of years, until their fuel is depleted. Because of the comparatively short age of the universe, no red dwarfs exist at advanced stages of evolution. The term "red dwarf" when used to refer to a star does not have a strict definition. One of the earliest uses of the term was in 1915, used simply to contrast "red" dwarf stars from hotter "blue" dwarf stars. It became established use, although the definition remained vague. In terms of which spectral types qualify as red dwarfs, different researchers picked different limits, for example K8–M5 or "later than K5". Dwarf M star, abbreviated dM, was also used, but sometimes it also included stars of spectral type K.
In modern usage, the definition of a red dwarf still varies. When explicitly defined, it typically includes late K- and early to mid-M-class stars, but in many cases it is restricted just to M-class stars. In some cases all K stars are included as red dwarfs, and occasionally even earlier stars. The coolest true main-sequence stars are thought to have spectral types around L2 or L3, but many objects cooler than about M6 or M7 are brown dwarfs, insufficiently massive to sustain hydrogen-1 fusion. Red dwarfs are very-low-mass stars. As a result, they have relatively low pressures, a low fusion rate, and hence, a low temperature. The energy generated is the product of nuclear fusion of hydrogen into helium by way of the proton–proton (PP) chain mechanism. Hence, these stars emit little light, sometimes as little as ​1⁄10,000 that of the Sun. Even the largest red dwarfs (for example HD 179930, HIP 12961 and Lacaille 8760) have only about 10% of the Sun's luminosity. In general, red dwarfs less than 0.35 M☉ transport energy from the core to the surface by convection. Convection occurs because of opacity of the interior, which has a high density compared to the temperature. 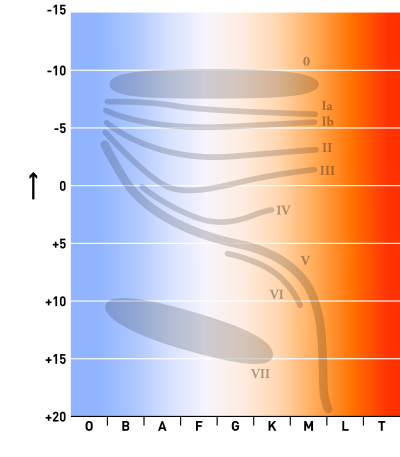 As a result, energy transfer by radiation is decreased, and instead convection is the main form of energy transport to the surface of the star. Above this mass, a red dwarf will have a region around its core where convection does not occur. 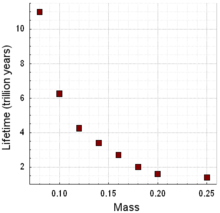 The predicted main-sequence lifetime of a red dwarf plotted against its mass relative to the Sun. Because low-mass red dwarfs are fully convective, helium does not accumulate at the core, and compared to larger stars such as the Sun, they can burn a larger proportion of their hydrogen before leaving the main sequence. As a result, red dwarfs have estimated lifespans far longer than the present age of the universe, and stars less than 0.8 M☉ have not had time to leave the main sequence. The lower the mass of a red dwarf, the longer the lifespan. 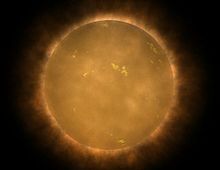 It is believed that the lifespan of these stars exceeds the expected 10-billion-year lifespan of our Sun by the third or fourth power of the ratio of the solar mass to their masses; thus, a 0.1 M☉ red dwarf may continue burning for 10 trillion years. As the proportion of hydrogen in a red dwarf is consumed, the rate of fusion declines and the core starts to contract. The gravitational energy released by this size reduction is converted into heat, which is carried throughout the star by convection. According to computer simulations, the minimum mass a red dwarf must have in order to eventually evolve into a red giant is 0.25 M☉; less massive objects, as they age, would increase their surface temperatures and luminosities becoming blue dwarfs and finally white dwarfs. The less massive the star, the longer this evolutionary process takes. It has been calculated that a 0.16 M☉ red dwarf (approximately the mass of the nearby Barnard's Star) would stay on the main sequence for 2.5 trillion years, followed by five billion years as a blue dwarf, during which the star would have one third of the Sun's luminosity (L☉) and a surface temperature of 6,500–8,500 kelvins. The fact that red dwarfs and other low-mass stars still remain on the main sequence when more massive stars have moved off the main sequence allows the age of star clusters to be estimated by finding the mass at which the stars move off the main sequence. This provides a lower limit to the age of the Universe and also allows formation timescales to be placed upon the structures within the Milky Way, such as the Galactic halo and Galactic disk. All observed red dwarfs contain "metals", which in astronomy are elements heavier than hydrogen and helium. The Big Bang model predicts that the first generation of stars should have only hydrogen, helium, and trace amounts of lithium, and hence would be of low metallicity. 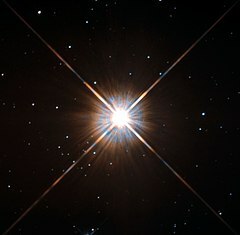 With their extreme lifespans, any red dwarfs that were a part of that first generation (population III stars) should still exist today. Low metallicity red dwarfs, however, are rare. There are several explanations for the missing population of metal-poor red dwarfs. The preferred explanation is that, without heavy elements, only large stars can form. Large stars rapidly burn out and explode as supernova, spewing heavy elements that then allow higher metallicity stars population II stars, including red dwarfs to form. Alternative explanations of the scarcity of metal-poor red dwarfs, such as their dimness and scarcity, are considered less likely because they appear to conflict with stellar-evolution models. Gliese 623 is a pair of red dwarfs, with GJ 623a on the left and the fainter GJ 623b to the right of center. The spectral standards for M-type stars have changed slightly over the years, but settled down somewhat since the early 1990s. Part of this is due to the fact that even the nearest red dwarfs are fairly faint, and the study of mid- to late-M dwarfs has progressed only in the past few decades due to evolution of astronomical techniques, from photographic plates to charged-couple devices (CCDs) to infrared-sensitive arrays. The revised Yerkes Atlas system (Johnson & Morgan 1953) listed only 2 M-type spectral standard stars: HD 147379 (M0 V) and HD 95735/Lalande 21185 (M2 V). While HD 147379 was not considered a standard by expert classifiers in later compendia of standards, Lalande 21185 is still a primary standard for M2 V. Robert Garrison does not list any "anchor" standards among the red dwarfs, but Lalande 21185 has survived as a M2 V standard through many compendia. The review on MK classification by Morgan & Keenan (1973) did not contain red dwarf standards. In the mid-1970s, red dwarf standard stars were published by Keenan & McNeil (1976) and Boeshaar (1976), but unfortunately there was little agreement among the standards. As later cooler stars were identified through the 1980s, it was clear that an overhaul of the red dwarf standards was needed. Building primarily upon the Boeshaar standards, a group at Steward Observatory (Kirkpatrick, Henry, & McCarthy 1991) filled in the spectral sequence from K5 V to M9 V. It is these M-type dwarf standard stars which have largely survived as the main standards to the modern day. There have been negligible changes in the red dwarf spectral sequence since 1991. Additional red dwarf standards were compiled by Henry et al. (2002), and D. Kirkpatrick has recently reviewed the classification of red dwarfs and standard stars in Gray & Corbally's 2009 monograph. The M-dwarf primary spectral standards are: GJ 270 (M0 V), GJ 229A (M1 V), Lalande 21185 (M2 V), Gliese 581 (M3 V), Gliese 402 (M4 V), GJ 51 (M5 V), Wolf 359 (M6 V), Van Biesbroeck 8 (M7 V), VB 10 (M8 V), LHS 2924 (M9 V). At least four and possibly up to six exoplanets were discovered orbiting within the Gliese 581 planetary system between 2005 and 2010. One planet has about the mass of Neptune, or 16 Earth masses (M⊕). It orbits just 6 million kilometers (0.04 AU) from its star, and is estimated to have a surface temperature of 150 °C, despite the dimness of its star. In 2006, an even smaller exoplanet (only 5.5 M⊕) was found orbiting the red dwarf OGLE-2005-BLG-390L; it lies 390 million km (2.6 AU) from the star and its surface temperature is −220 °C (53 K). In 2007, a new, potentially habitable exoplanet, Gliese 581c, was found, orbiting Gliese 581. The minimum mass estimated by its discoverers (a team led by Stephane Udry) is 5.36 M⊕. The discoverers estimate its radius to be 1.5 times that of Earth (R⊕). Since then Gliese 581d, which is also potentially habitable, was discovered. Gliese 581c and d are within the habitable zone of the host star, and are two of the most likely candidates for habitability of any exoplanets discovered so far. Gliese 581g, detected September 2010, has a near-circular orbit in the middle of the star's habitable zone. However, the planet's existence is contested. On 23 February 2017 NASA announced the discovery of seven Earth-sized planets orbiting the red dwarf star TRAPPIST-1 approximately 39 light-years away in the constellation Aquarius. The planets were discovered through the transit method, meaning we have mass and radius information for all of them. TRAPPIST-1e, f and g appear to be within the habitable zone and may have liquid water on the surface. Planetary habitability of red dwarf systems is subject to some debate. In spite of their great numbers and long lifespans, there are several factors which may make life difficult on planets around a red dwarf. First, planets in the habitable zone of a red dwarf would be so close to the parent star that they would likely be tidally locked. This would mean that one side would be in perpetual daylight and the other in eternal night. This could create enormous temperature variations from one side of the planet to the other. Such conditions would appear to make it difficult for forms of life similar to those on Earth to evolve. And it appears there is a great problem with the atmosphere of such tidally locked planets: the perpetual night zone would be cold enough to freeze the main gases of their atmospheres, leaving the daylight zone bare and dry. On the other hand, recent theories propose that either a thick atmosphere or planetary ocean could potentially circulate heat around such a planet. Variability in stellar energy output may also have negative impacts on the development of life. Red dwarfs are often flare stars, which can emit gigantic flares, doubling their brightness in minutes. This variability may also make it difficult for life to develop and persist near a red dwarf. It may be possible for a planet orbiting close to a red dwarf to keep its atmosphere even if the star flares. However, more-recent research suggests that these stars may be the source of constant high-energy flares and very large magnetic fields, diminishing the possibility of life as we know it. Whether this is a peculiarity of the star under examination or a feature of the entire class remains to be determined. ^ Reiners, A.; Basri, G. (March 2009). "On the magnetic topology of partially and fully convective stars". Astronomy and Astrophysics. 496 (3): 787–790. arXiv:0901.1659. Bibcode:2009A&A...496..787R. doi:10.1051/0004-6361:200811450. ^ Lindemann, F. A. (1915). "The age of the Earth". The Observatory. 38: 299. Bibcode:1915Obs....38..299L. ^ Edgeworth, K. E. (1946). "Red Dwarf Stars". Nature. 157 (3989): 481. Bibcode:1946Natur.157..481E. doi:10.1038/157481d0. ^ Dyer, Edward R. (1956). "An analysis of the space motions of red dwarf stars". Astronomical Journal. 61: 228. Bibcode:1956AJ.....61..228D. doi:10.1086/107332. ^ Mumford, George S. (1956). "The motions and distribution of dwarf M stars". Astronomical Journal. 61: 224. Bibcode:1956AJ.....61..224M. doi:10.1086/107331. ^ Vyssotsky, A. N. (1956). "Dwarf M stars found spectrophotometrically". Astronomical Journal. 61: 201. Bibcode:1956AJ.....61..201V. doi:10.1086/107328. ^ Engle, S. G.; Guinan, E. F. (2011). "Red Dwarf Stars: Ages, Rotation, Magnetic Dynamo Activity and the Habitability of Hosted Planets". 9th Pacific Rim Conference on Stellar Astrophysics. Proceedings of a conference held at Lijiang. 451: 285. arXiv:1111.2872. Bibcode:2011ASPC..451..285E. ^ Heath, Martin J.; Doyle, Laurance R.; Joshi, Manoj M.; Haberle, Robert M. (1999). "Habitability of planets around red dwarf stars". Origins of Life and Evolution of the Biosphere. 29 (4): 405–24. doi:10.1023/A:1006596718708. PMID 10472629. ^ Farihi, J.; Hoard, D. W.; Wachter, S. (2006). "White Dwarf-Red Dwarf Systems Resolved with the Hubble Space Telescope. I. First Results". The Astrophysical Journal. 646: 480. arXiv:astro-ph/0603747. Bibcode:2006ApJ...646..480F. doi:10.1086/504683. ^ Pettersen, B. R.; Hawley, S. L. (1989). "A spectroscopic survey of red dwarf flare stars". Astronomy and Astrophysics. 217: 187. Bibcode:1989A&A...217..187P. ^ Alekseev, I. Yu. ; Kozlova, O. V. (2002). "Starspots and active regions on the emission red dwarf star LQ Hydrae". Astronomy and Astrophysics. 396: 203. Bibcode:2002A&A...396..203A. doi:10.1051/0004-6361:20021424. ^ Dieterich, Sergio B.; Henry, Todd J.; Jao, Wei-Chun; Winters, Jennifer G.; Hosey, Altonio D.; Riedel, Adric R.; Subasavage, John P. (2014). "The Solar Neighborhood. XXXII. The Hydrogen Burning Limit". The Astronomical Journal. 147 (5): 94. arXiv:1312.1736. Bibcode:2014AJ....147...94D. doi:10.1088/0004-6256/147/5/94. ^ a b Richmond, Michael (November 10, 2004). "Late stages of evolution for low-mass stars". Rochester Institute of Technology. Retrieved 2007-09-19. ^ Chabrier, G.; Baraffe, I.; Plez, B. (1996). "Mass-Luminosity Relationship and Lithium Depletion for Very Low Mass Stars". Astrophysical Journal Letters. 459 (2): L91–L94. Bibcode:1996ApJ...459L..91C. doi:10.1086/309951. ^ Padmanabhan, Thanu (2001). Theoretical Astrophysics. Cambridge University Press. pp. 96–99. ISBN 0-521-56241-4. ^ a b c Adams, Fred C.; Laughlin, Gregory; Graves, Genevieve J. M. (2004). "Red Dwarfs and the End of the Main Sequence" (PDF). Gravitational Collapse: From Massive Stars to Planets. Revista Mexicana de Astronomía y Astrofísica. pp. 46–49. Bibcode:2004RMxAC..22...46A. ^ Fred C. Adams & Gregory Laughlin (1996). "A Dying Universe: The Long Term Fate and Evolution of Astrophysical Objects". Reviews of Modern Physics. 69 (2): 337–372. arXiv:astro-ph/9701131. Bibcode:1997RvMP...69..337A. doi:10.1103/RevModPhys.69.337. ^ Kaltenegger, Lisa; Traub, Wesley A. (June 2009). "Transits of Earth-like Planets". The Astrophysical Journal. 698 (1): 519–527. arXiv:0903.3371. Bibcode:2009ApJ...698..519K. doi:10.1088/0004-637X/698/1/519. ^ a b Johnson, H. L.; Morgan, W. W. (1953). "Fundamental stellar photometry for standards of spectral type on the revised system of the Yerkes spectral atlas". Astrophysical Journal. 117: 313. Bibcode:1953ApJ...117..313J. doi:10.1086/145697. ^ Garrison, Robert F. "MK Anchor Point Standards table". University of Toronto Department of Astronomy & Astrophysics. ^ a b Kirkpatrick, J. D.; Henry, Todd J.; McCarthy, Donald W. (1991). "A standard stellar spectral sequence in the red/near-infrared - Classes K5 to M9". Astrophysical Journal Supplement Series. 77: 417. Bibcode:1991ApJS...77..417K. doi:10.1086/191611. ^ Keenan, Philip Childs; McNeil, Raymond C. (1976). "An atlas of spectra of the cooler stars: Types G, K, M, S, and C. Part 1: Introduction and tables". Columbus: Ohio State University Press. Bibcode:1976aasc.book.....K.
^ Boeshaar, P. C. (1976). "The spectral classification of M-dwarf stars". Bibcode:1976PhDT........14B. ^ Henry, Todd J.; Walkowicz, Lucianne M.; Barto, Todd C.; Golimowski, David A. (2002). "The Solar Neighborhood. VI. New Southern Nearby Stars Identified by Optical Spectroscopy". The Astronomical Journal. 123 (4): 2002. arXiv:astro-ph/0112496. Bibcode:2002AJ....123.2002H. doi:10.1086/339315. ^ Gray, Richard O.; Corbally, Christopher (2009). "Stellar Spectral Classification". Stellar Spectral Classification by Richard O. Gray and Christopher J. Corbally. Princeton University Press. Bibcode:2009ssc..book.....G.
^ Yann Alibert (2016). "Formation and composition of planets around very low mass stars". Astronomy and Astrophysics. 539 (12 October 2016): 8. arXiv:1610.03460. Bibcode:2017A&A...598L...5A. doi:10.1051/0004-6361/201629671. ^ "Scientists find potentially habitable planet near Earth". Physorg.com. Retrieved 2013-03-26. ^ "NASA Telescope Reveals Record-Breaking Exoplanet Discovery | NASA". www.nasa.gov. ^ Charles Q. Choi (9 February 2015). "Planets Orbiting Red Dwarfs May Stay Wet Enough for Life". Astrobiology. Retrieved 15 January 2017. ^ Vida, K.; Kővári, Zs. ; Pál, A.; Oláh, K.; Kriskovics, L.; et al. (2017). "Frequent Flaring in the TRAPPIST-1 System - Unsuited for Life?". The Astrophysical Journal. 841: 2. ^ Alpert, Mark (1 November 2005). "Red Star Rising". Scientific American. A. Burrows; W. B. Hubbard; D. Saumon; J. I. Lunine (1993). "An expanded set of brown dwarf and very low mass star models". Astrophysical Journal. 406 (1): 158–171. Bibcode:1993ApJ...406..158B. doi:10.1086/172427. "VLT Interferometer Measures the Size of Proxima Centauri and Other Nearby Stars". European Southern Observatory. November 19, 2002. Archived from the original on January 3, 2007. Retrieved 2007-01-12. Look up red dwarf in Wiktionary, the free dictionary. Wikimedia Commons has media related to Red dwarfs.